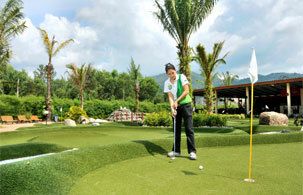 Phuket Adventure Mini Golf – Fun for Everyone! A challenging 18 holes miniature classic championship golf course surrounded by palm trees, stones, water, bamboo and bushes. Whether living close by or here on a fabulous holiday, this is the place for the whole family, friends and couples to enjoy at all times. Even for the "real" golf player this is a perfect place to practice your putting technique. Is an open-air restaurant from where you have full view over the mini golf park. Our signature thin crust homemade pizzas are served directly from the pizzaiola station. The menu includes a wide range of Thai- & international food as well as a great children menu. 10m well stocked bar with all of your favorite drinks and cocktails. We take pride in arranging your perfect day; Private company party, celebration, networking event or children's party. Our service can fulfill for all of your needs with our customized service. 18 holes of mini golf take about 1-1.5 hour to play depending on how many players you are. We recommend not more than 4 players per team and from 4 years age and up.